I’ve been arguing for several months now that the durability of ISIS over the long-run is going to be a lot less about ability to rapidly take over territory with mobile light infantry than about ability to hold the territory they already have. Beheadings, massacres, and general intimidation can keep people docile for a while, but in the end every territorial administration — whether a state or a non-recognized/non-state actor — has to balance that with substantial provision of basic services, governmental functions, and food access. Otherwise people just get hungry enough and angry enough to overthrow you no matter how many gunmen you have on payroll. Fluid terrorist organizations that move easily between physical locations and do not attempt to run a state can basically do whatever they want and be as vicious as they want. But organizations that set themselves up in a defined physical space (a territory) and attempt to take over or establish a new state (or pseudo-state) quickly find that the administration capacity question is what makes or breaks their ability to remain in control. Hamas in the Gaza Strip, Hezbollah in Lebanon, and al-Shabab in southern Somalia, have all proven that they can gain a ton of local support by providing government functions effectively and providing food and services to their constituent populations effectively (particularly when compared to the alternative vacuum). They are so good at the “welfare” part of the welfare state that they can take actions that directly or indirectly cause harm to their populations and they will still remain highly popular within their territories. For example, as I examined previously, al-Shabab has spent millions of dollars since 2011 on serious, long-term agro-infrastructure development in southern Somalia to reduce famine risk and create and independent local food production capacity that breaks the cycle of dependence on food imports. 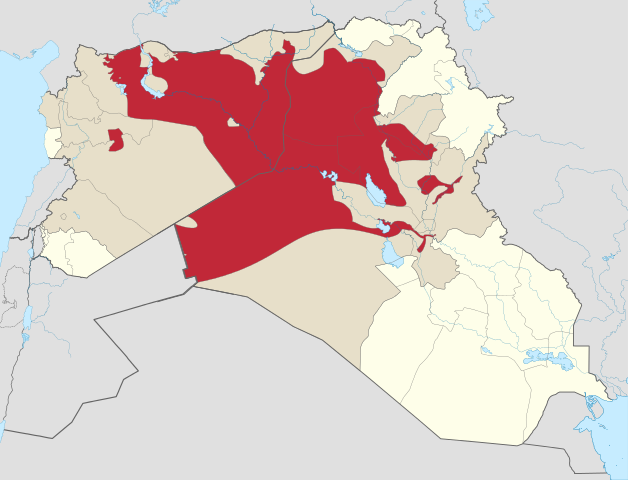 ISIS has declared itself to be “The Islamic State” and has carved out an entirely new administrative district, Forat Province, based on the Arabic name for the Euphrates River, which spans part of eastern Syria and western Iraq. They have clearly established themselves in the territorial-control model of terrorist organizations. Contrary to much of the breathless media reporting focusing on their rapid traversing of desert highways, the expansion of ISIS is far from unstoppable or perfectly stable. Already they have reached the point where they have disrupted local administrative functions so heavily that they need to slow down and resume bureaucratic operations to keep everything spinning smoothly enough for people to remain accepting of their rule in the places they’ve already captured. In particular, the core of the ISIS sphere of control poses a lot of challenges for the organization. A lot of local community leaders in eastern Syria are economic mercenaries, exploiting the civil war’s chaos, with only the thinnest of allegiances to ISIS, who will turn on them without a moment’s notice if a better opportunity comes along that ISIS can’t outmatch. But the group’s use of violence has not been entirely indiscriminate. The group has often traded with businessmen loyal to Assad when it has suited its interests, for instance. According to one fighter, a former Assad employee is now in charge of mills and distributing flour to bakeries in Raqqa. Employees at the Raqqa dam, which provides the city with electricity and water, have remained in their posts. Islamic State’s willingness to use former Assad employees displays a pragmatism residents and activists say has been vital to its success holding onto territory it has captured. They’ve also been trying to figure out how to raise oil and gas production and sales from all these oilfields and gasfields they’ve captured all over Syria and Iraq before remembering that they aren’t an oil company. As they quickly figured out with the region’s many major hydroelectric dams, you had better not execute or scare off the people who know how to produce your marketable assets and keep your lights turned on, unless you know how to do it yourself. Clearly, the next stage of the war in Syria (and to some extent northern and western Iraq) will be about degrading administrative and economic function of ISIS in their captured territories, not just about destroying their rocket launcher units and humvees. As I argued in recent weeks, with the western Syrian rebel threat under control, Syria’s government is now turning its military attentions to ISIS and probably now has the capacity and experience to defeat them militarily if they bring full strength to bear. Of course, since it was a bakery, not an airbase or barracks, a lot of civilians died in the air raid. In true Syrian Air Force form, bombing a lot of civilians and civilian targets to degrade support functions for local rebels (in this case ISIS, but we’ve seen it for the past year in western Syrian cities against FSA/Nusra groups) is considered an acceptable strategy with proven battlefield results. Bottom line: With Assad hitting the infrastructure and government services of ISIS, I suspect the group won’t be able to last in eastern Syria.﻿ It might take some time, but they will be worn down, much like the fighters in the West. They are far from invincible. And if they do beat the odds and stake out a breakaway state within Syria and/or Iraq, they will only do so by strengthening their provision of services and relaxing repression of the local population to bearable levels. Theoretical maximum sphere of ISIS control as of early September 2014, via Wikimedia. Keep in mind that control is tenuous in outlying desert village areas and limited to major thoroughfares/cities in many areas. There is debate over how to map this reality more accurately. Tagged Bashar al Assad, FSA, ISIS, Middle East, Nusra Front, Syria, terrorism. Is Obama’s anti-ISIS operation really just intended to overthrow Assad?